Vintage MG Parts have created a new L/K Type pattern copying the original but with a couple of advantageous modifications. This sump has not been reproduced for many years. The main differences between the L/K Type and slightly later N Type sump were that the latter incorporated a longer oil strainer to assist in avoiding oil starvation problems, the rear bolt holes to the flange were further apart, the sump was 7/8 inch deeper to enhance oil capacity and also had a recessed rear section to assist in the revised oil feed to the rear main and crank. The dipstick arrangement was also different on the L/K compared to the N and we already manufacture the separate castings to include the L/K as well as the KD arrangement with additional oil drain from the later N cylinder head. 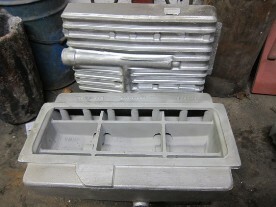 Originally, when the L sump was fitted to the K1/K2 and early K3, an additional spacer casting was sandwiched between the block and sump to enhance the capacity. When contemplating fitting a sump to the K Type, the later K3 cars were initially fitted with the larger triangular sumps. Whilst enthusiasts have a choice, the reproduction late K3 sumps are generally extremely heavy although more importantly, the factory design was found to be too efficient in it's cooling and as such, does not allow the engine to reach it's optimum working temperature. This alternative design is a bespoke product which is unique to VMGP. This latest reproduction sump includes all of the original L/K Type features although has been modified to utilise the longer N Type strainer, the sump depth has been increased to match the later N Type and does not include the N Type rear oil feed recess. 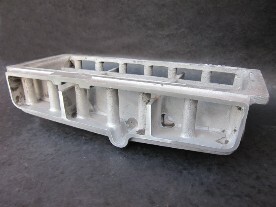 As with the 'VMGP' N Type sump we carry in stock, this sump again has all correct factory reference numbers in the1930s font on the top side of the casting. The above image on the right shows our prototype which has been sectioned to check the wall thicknesses. The sumps are cast in LM4 and are fully machined and double vacuum impregnated. We manufacture L/K Type dipstick holder castings including the KD casting and the L/K dipsticks. We also manufacture sump oil strainers and sump oil strainer hex spanners for all MMM models. Please note that the larger N Type strainer is to be used inconjunction with this product.